Maytronics Dolphin repair is very limited. Limited to the outside of your Dolphin Automatic Pool Cleaner. Forget about replacing the pump and motor. Unless you have a spare robot for parts, internal maytronics parts are impossible to get. Your dealer will send your robot out for repair. Prevention is the best remedy. 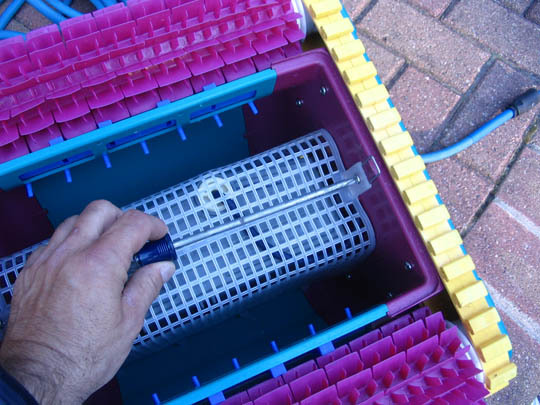 Avoid operating your Maytronics cleaner under any conditions that will clog the bag and prevent water circulation around the motor housing. Heat will destroy the electrical components inside the case. Re-coil the cable after every use starting at the robot and working the twists outward to the plug. Chances are...if your cable will not float straight and is always being sucked into the robot, that cable has most likely been stored in a piled twisted mess. Recoiling the cable takes all of 30 seconds and saves hours of aggravation. 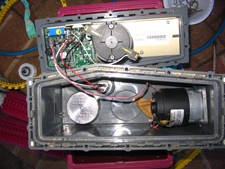 I have several photos including a photo of the inside of the motor housing. 1. Remove the bottom plate with bag. 2. 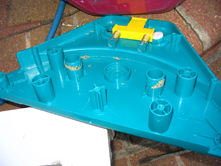 With the machine upside down, remove the screws holding the debris shield and remove the shield. 3. Remove the screws holding the side plate. 4. Gently pry off the sideplate. It may need much persuasion due to dirt buildup on the sideplate pegs that slide into the body. Be sure to clean dirt, debris and other contaminants from the parts that slide into each other. 5. Remove the drive track. 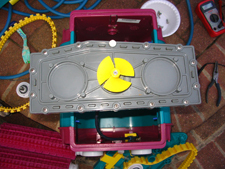 The system is direct drive with the drive gear in the center. Drive gear and pulleys slide off the spindles. FOR THE CURIOUS I opened a motor compartment to satisfy the question of what is in it. No instructions are included to put it back together because parts are unavailable. The motor assembly inside the robot body is held in place by screws accessible once the sideplates are removed. 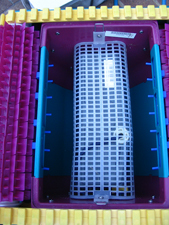 Inside the box is the pump, drive motor, circuit board and a counterweight to offset the buoyancy of the air filled box. 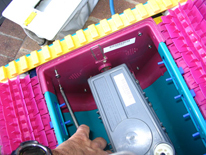 Opening this box creates the challenge of airtight reassembly. The gasket must be re-used and I suggest a good coating of silicone to keep it pliable and easier to slide into position. Notice the motors have little direct cooling contact with the water. Post your story or question here. My Dolphin is 7 years old. The track belts is starting to come off quite frequently . Do I need to replace the tracking wheels or the belt itself? What is the value of the D2 diode (between the two big blue resistors)? No more Maytronics Robots - don't touch them unless you are willing to buy a new one every 2 years! any suggestions on how to remove the side plate on a dolphin deluxe 4? My power supply box got drug into the pool. Tripped the breaker.now won't turn on???? R14 Burned 2410075LF Rev 01 Control Board The R14 Resistor is burned out. What is the resistance value? Thanks. how do you replace the side panel with the electric cord running through? Hola, necesito reparar mi limpiafondos, donde puedo comprar la placa electrónica que está dentro del compartimiento junto al motor? muchas gracias. Dolphin Power Supply got dunked - no Bueno? Getting to the brain- unit works but shuts off prematurely? Come read this! I put in r2d2 my dolphin dynamic in today and it appears that the the water is being sucked in the top rather than thru the bottom. Any ideas? Dolphin Rev 09 board has different type resistors than the troublesome old ones. Dolphin Deluxe 4, fan on top runs for 2 seconds and then stops , no tracks movements, power supply light stays on. I cant work out how to remove the tracks and wheels without breaking something or tottally pulling it apart. Is there an easy way? My Dolphin won't run for more than 30-60 seconds! 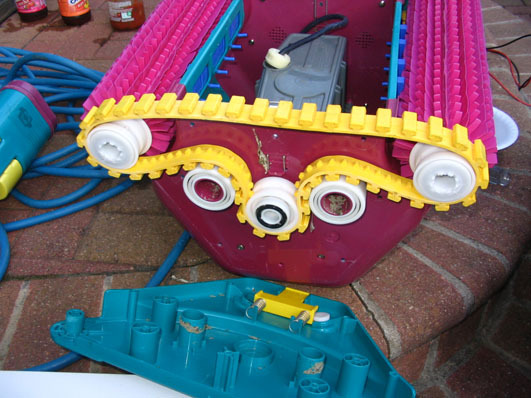 My dolphin pool cleaner wont sink to the bottom of pool just floats, unit is working just floats. 4X4 dolphin one set of treads turning. Dolphin Filter Screen just crumbled. Where can I purchase new tracks? my dolphin 2002 dynamics plus problem. How do I change fuse? The light on the power supply is lit. Does that mean fuse is OK? please advise for the power supply dynamic DC 99 95678. no longer turns on from power supply. Appreciate your time to respond very much. Doesn't seem to get to the corners in our pool. ADMIN REPLY: This is a problem common to many robots. Simply brush debris out of the corners.